Melker Orskar is a innovativ and flexible double kayak that is easily transformed into a single or tripple kayak with an extra cockpit for the child or pet read more about Melker Orskar here. 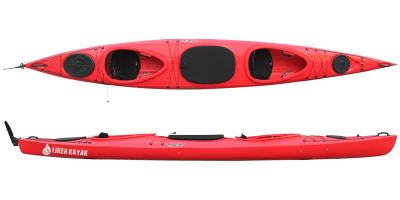 This kayak has extra volume and a convenient center area to carry your child, four legged friend or extra-large camping equipment on the trip. The hull is designed to be with a high initial stability, quick acceleration and high end speed, read more. Tandem Mini, is incredibly versatile tandem with great stability, exceptional handling and comfort of a recreational kayak, read more here. Lifestyle Duo PE is a unique family boat with complete package of speed, control, and comfort. It is suitable for medium to large sized paddlers, read more here. Easty D 5.5 is a roomy and stable multipurpose kayak, that will surprise even experienced paddlers with its maneuverability and efficiency. While easy to master for the beginner, the behavior in wind and waves will appeal to the experienced paddler, read more here.